Installation view, Performer/Audience/Mirror, July 15 - September 3, 2016, Lisson Gallery. 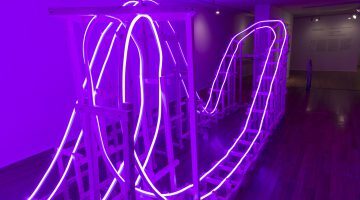 Warning: this exhibition is not suitable for those with short attention spans. Nor is it all that suitable for a relaxed, summer audience. Unless you are hip-deep in your studies for that M.A., M.F.A., or PhD. 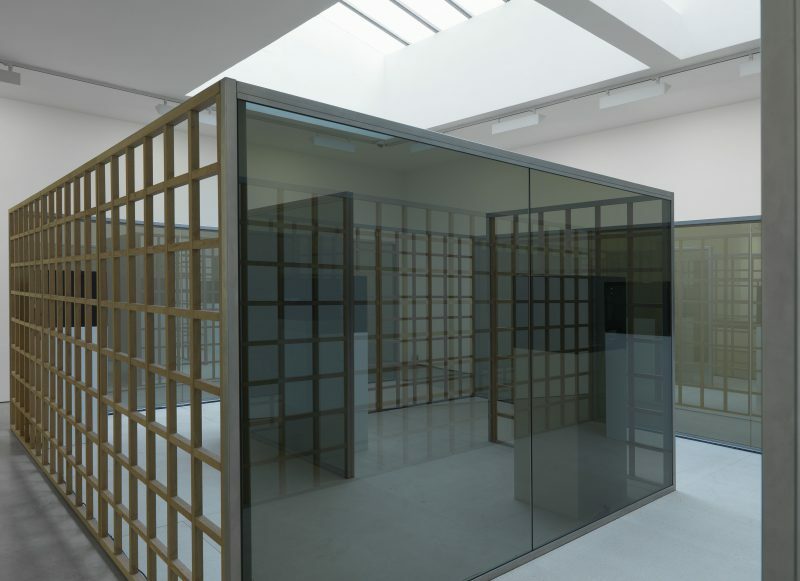 (in film or new media studies, to be precise), Performer/Audience/Mirror at Lisson Gallery’s Bell Street space becomes very tiresome very quickly. The show’s title is borrowed from Dan Graham’s 1977 performance at de Appel Arts Centre in Amsterdam, one of the earliest expositions of direct audience interaction and reflexivity in performance art. 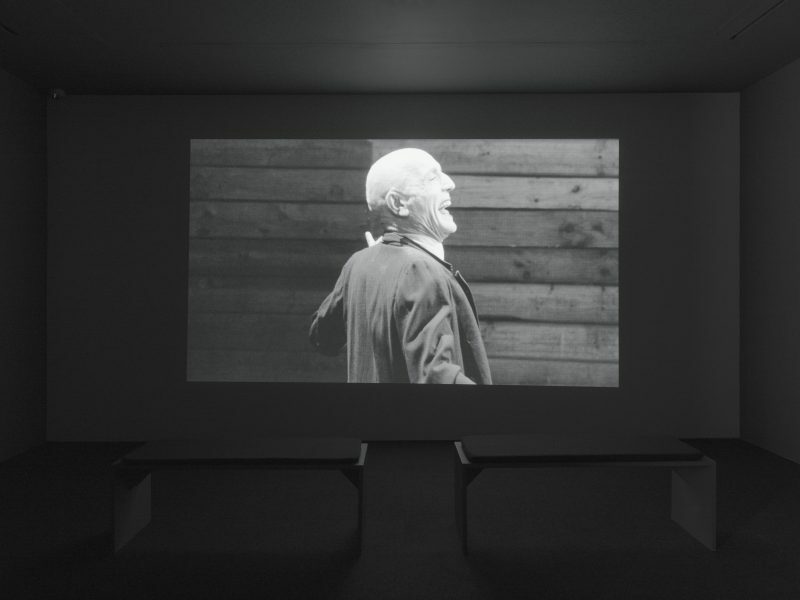 The gallery’s approach adopts video works to adhere to each of the three components of Graham’s initial work. Performer is meant to reflect the artists, themselves, in the process of being recorded or recording their own interests, Audience takes place within a labyrinthine pavilion (a 2001 work entitled Greek Meander Pavilion, Open Shoji Screen Version, designed by Graham) where the audience engages with works put on several TV monitors within the structure, and Mirror is a dark screening room where the films have an overarching interest in a direct reflection of societal habits and behaviors. 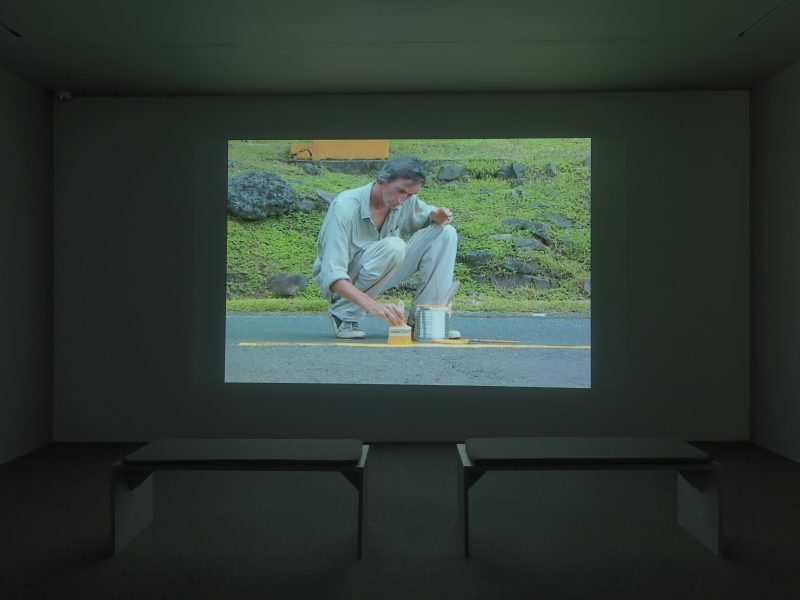 Installation view, Performer/Audience/Mirror, July 15 – September 3, 2016, Lisson Gallery. Graham’s pavilion (the Audience sector) catches the eye first, built from open-panelled wood, which is reflected (along with the four TV monitors) in large panes of mirrored plastic within. Sets of headphones hang nearby (the gallery assistant noted that there was no sound in the work, and yet the headsets weren’t meant to cancel all noise). 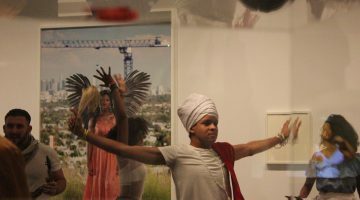 The works I caught included Ceal Floyer’s Downpour (2004), Ryan Gander’s An alternative timeframe for a gallery exhibition (2010), and the first five seconds of Graham’s performance. I became frustrated rather swiftly: to stand and consume these works (augmented by the seemingly useless headphones) was one thing, but I detected obvious disinterest from other people in the space. What could you hope to gain by watching these films had you not thoroughly read through the exhibition booklet? 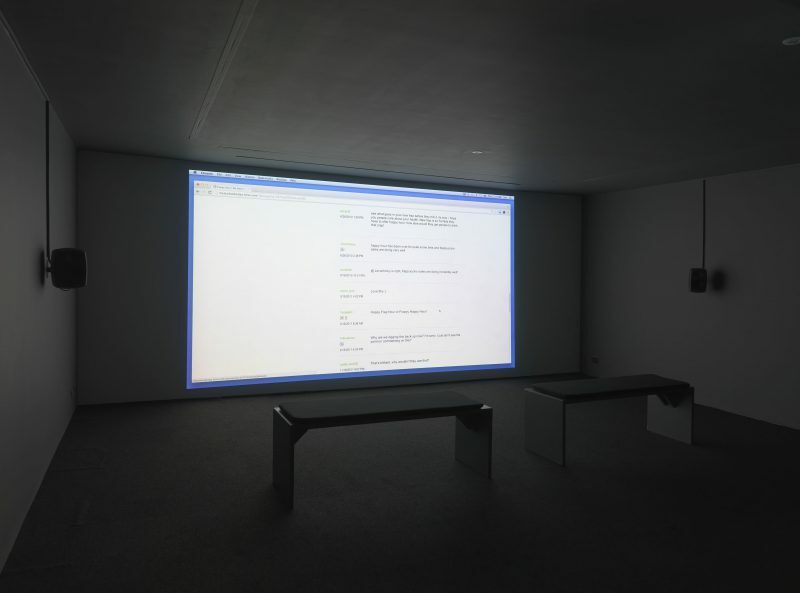 The films themselves seem to contain deeply-encrypted commentaries on the relationship between a viewer and “itself” (the film as a kind of responsive entity); but unless you possessed active knowledge of pre-Internet, postmodern contemporary visual theory, I’d venture that 90 percent of gallery-goers would simply give up after two minutes, or ignore the screen entirely. The gallery notes that a series of online screenings are scheduled throughout the run (their link doesn’t seem to work), should you miss one or two or three of the films in-situ. It strains credibility to boast that the first thing you’d do once comfortably at home is to commit to what could only be described as “homework.” Full disclosure: I requested a link to see the much-talked-about Francis Alÿs film The Nightwatch (2004), which I did watch at home. I was unmoved until the protagonist, an adorable little fox, wandering the halls of the National Portrait Gallery finally curled up atop a covered vitrine. On its own, the film has interesting points to make regarding surveillance and the habits of cultural consumption. Within the lineup of the other films, however, I hesitate to say that its impact is proportionate. After only a brief glimpse at the Performer section, I headed upstairs to see what Mirror had to offer. What I got was just short of tedium ad nauseam: nearly 30 minutes of Cory Arcangel’s Ideas in Action (starbucks.com) (2014), a moving screen-capture of a browse through the comments sections of Starbucks’ corporate website. Yes, I know that the artist demonstrates how the seemingly-pointless exercise of the public feeding into a corporate culture is its own form of entertainment, but then what? Does Arcangel offer a resolution? Is this simply empty commentary? 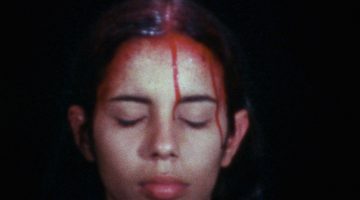 More than feeling confused and unsatisfied, I left this exhibition feeling patronized—as if even with a degree in Art History, I had to have contemporary film laid out for me to consume, knowing that every piece is one whose historic value was beyond argument. True, I could be accused of just scratching the surface at, what is supposed to be, a complex presentation of a sampling of influential performance art. I do hope that in the future, Lisson finds a more user-friendly platform for presenting avant-garde film that reaches out as much to a general audience as an academic one.